The LRFT25 rewinders are vertical table top models with splicing table and two motor controllers – one working as an unwinder and the other as a rewinder and the design offers control of the web tension which ensures superior winding quality. The mandrels are air expansion mandrels with sleeves easily exchangeable to other sizes. a touch panel makes the operation of the machine very easy with graphic figures showing the rewind direction, and the direction of rotation for the shafts. The machine has integrated label counter. Options include web guide, missing label system and meter counter. In case of a missing label, the machine stops and places the error on the splice table with high precision. A small LR11T “at table” version is also available for narrow webs. 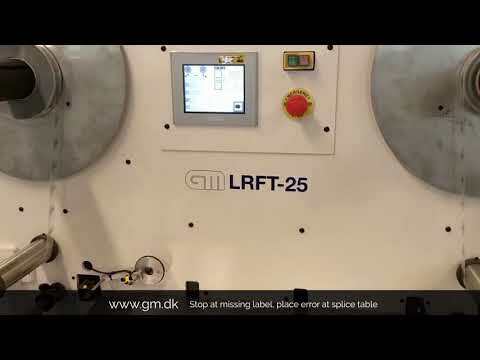 The idea used for designing the LRFT25 is that all functions should be integrated in the machine from the beginning - label counter, meter counter, splice detection, missing label and waste paper detection. That means the end of mounting and installation of separate units for these functions. The only optional device to be ordered to make the counting and inspection functions active is the relevant sensor! In this way it is easy for the user to upgrade the machine with the different options - the only thing needed is the sensor. Sensor for detection of missing labels and waste matrix. Capacitive sensor for “clear on clear” labels. Extra sleeves, diameter 25-120 mm. Strobe, 8 W or 30 W lamp power. Max web width 250mm 4.3", 7" or 9.8"
Minimum web width 10mm 0.4"
Max. unwind diameter Ø400 mm 15.7"
Max rewind diameter Ø350 - 400 mm 13.8 - 15.7"
Mandrel size 25 - 120 mm 1 - 4.7"
The LR11T is a table top rewinder for fast rewinding of labels. The LRN25T rewinding and inspection unit is designed especially for demanding rewind jobs of high quality.